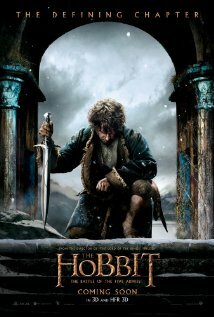 The Hobbit trilogy comes to an end in one big monumental fight! It’s these great wars that made the original Lord of the Rings films, but more was needed if The Hobbit was going to reach those levels. After Smaug escapes from the mountain (and is quickly killed, sorry if I spoilt the surprise! ), everyone looks at the gold-filled mountain as a source of wealth and power, causing armies from across the land to fight over it – including Sauron’s horde of Orcs. All the acting performances were okay, and up to the levels of the previous films. I’ve never really liked Martin Freeman as Bilbo Baggins – I find myself always seeing him in his role in The Office (UK) TV series, so it’s hard to take him too seriously. It is worth noting however that he convinced me more in this film than in The Desolation of Smaug. A lot of the dialogue sounds like something from a Shakespeare play, and it is all performed and projected in the same way – all to a credible standard by the rest of the cast. Again, like in many of the other Middle Earth films – all directed by Peter Jackson – the film relies on the scenery and the CGI as much as anything else. The films have won many fans simply on the look of the environment and again The Battle of the Five Armies takes you on an adventure across beautiful terrain. The rest of the shots seem in order, if not spectacular. The fight scenes are okay, if not entirely believable. All in all, to me it just feels like another Hobbit film – something that has failed to captivate me like it has some people. It hasn’t tried to do anything that we haven’t seen in other Middle Earth films, which you might see as a good thing! Seen The Battle of the Five Armies? Tell us what you thought!